The entire ALR Industries Team shares this passion for bringing the absolute best products available to the consumer. We stand behind the safety, reliability, and effectiveness of all our products, and offer a full money back, satisfaction guarantee on every product we sell. We are committed to constantly raising the bar and setting new standards for quality and effectiveness in the supplement industry. At ALR Industries we also feel strongly about supporting the athletes who set the example of refusing mediocrity daily. In 2006 we donated thousands of dollars in ALR Industries supplements to Bodybuilding, Fitness, and Figure athletes at both the amateur and professional levels. We have plans to do even more in 2009 and beyond. We believe that by supporting those who are an example of what we stand for, we help ensure that they are able to inspire even more to do the same. It is the passion of everyone on the Team at ALR Industries, to give those who are working hard the tools to push beyond their limits. We will continue to constantly strive to bring you the most innovative and effective products on the market to help you be the best you can be. Just as Author L. Rea stated in the beginning, "Whining is not an option for those who refuse to accept Mediocrity." 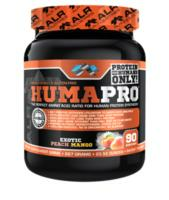 The Natural City is proud to stock the following ALR Industries supplements, Humapro - balanced amino profiles and Chain'd Out- Balanced BCAA formula.